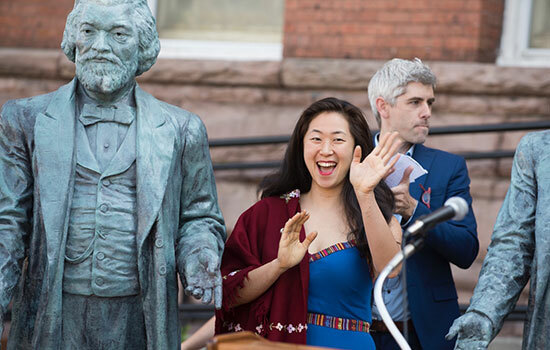 Olivia Kim, an adjunct professor in RIT's School of Art, has unveiled the first three of 13 Frederick Douglass sculptures as part of the yearlong Re-energizing the Legacy of Frederick Douglass commemoration and reflection across the Rochester area. An adjunct professor in RIT’s School of Art has created three magnificent monuments, with more to come, to honor Frederick Douglass’ living legacy as a man and freedom-seeker and his 25 years in Rochester, N.Y., that resulted in some of his most influential life’s work. 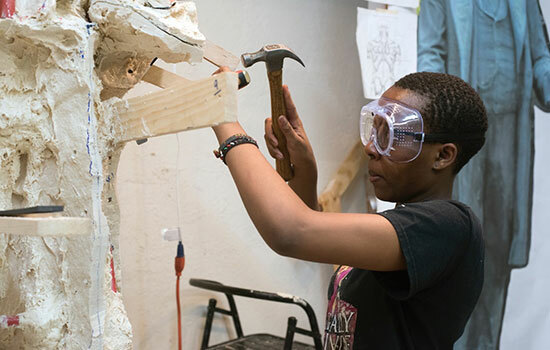 Olivia Kim is shaping and molding 13 sculptures to help mark 200 years after the birth of Douglass. Her first three sculptures were unveiled in downtown Rochester July 19 at the Hochstein School of Music and Dance—site of Douglass’ funeral. 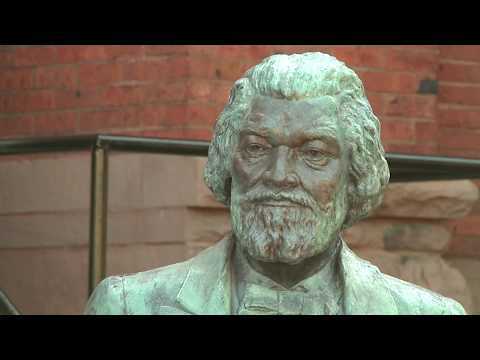 Kim’s sculptures will make up a self-guided tour to sites around Rochester and form the resounding centerpiece of the yearlong “Re-energizing the Legacy of Frederick Douglass” commemoration and reflection happening across the Rochester area. Her sculptures were influenced by the Stanley W. Edwards statue of Douglass that currently stands in Rochester’s Highland Park—the first monument in the nation erected to an African American citizen. Each of the fiberglass monuments, molded from an original Kim sculpture, stands over six feet tall and weighs around 40 pounds. In a significant departure from the original Edwards monument, however, Kim’s sculpture integrates the hands of Kenneth B. Morris Jr., the great-great-great grandson of Douglass. Morris is co-founder and president of the Frederick Douglass Family Initiatives and also the great-great grandson of Booker T. Washington, an American educator, author, orator and adviser to U.S. presidents in the late 1800s and early 1900s. A QR code at the foot of each monument will explain its location, making the walking tour interactive. She used social media under the guise of a “secret sculpture project” in reaching out for volunteers. Among over 50 volunteers who answered Kim’s call were a rising, second-year medical illustration student who had just taken Kim’s Figure Sculpture class and another RIT adjunct professor already intimately familiar with her work. Princess Tumushabe, 19, called working with Kim “mind blowing” and said the experience to help create the monuments has been life-changing for her. During her numerous trips to Kim’s studio in the basement of the Hungerford Building downtown, Tumushabe said it was easy to lose track of time during marathon sessions. Kim built her prototype using metal piping, foam and wire and clay. She asked a local clothing designer to make her a fabric version of the long coat Douglass is wearing in the sculpture and she molded the clay around it. She then built a 26-piece mold and creates the statues by layering epoxy and fiberglass. Rather than spray painting the sculptures, the color is part of the statue material. Kim’s meticulous attention to detail has made a lasting impression on Tumushabe. “I’ve learned how the smallest things can make the biggest difference,” she said. Bill Wynkoop already was familiar with Kim’s sculpting talent when he answered her email call for volunteers. The adjunct professor in RIT’s packaging science program asked Kim a few years ago to create a sculpture of his wife, Beth, as she embarked on an amateur bodybuilding career. The community art project continues as Kim works intensely over the upcoming weeks to deliver the remaining sculptures. Go to www.DouglassTour.com for more information, including a self-guided walking/driving tour map, biographical information and other resources.